The cajon was most likely developed in coastal Peru during the early 19th century or before, where it is associated with several Afro-Peruvian genres. The instrument reached a peak in popularity by 1850, and by the end of the 19th century cajon players were experimenting with the design of the instrument by bending some of the planks in the cajon's body to alter the instrument's patterns of sound vibration. 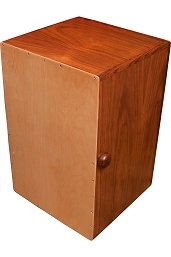 The modern cajón is often used to accompany the acoustic guitar and is showing up on worldwide stages in contemporary music.